The other day I wrote a post about the best way to create a Sharpie pillow. 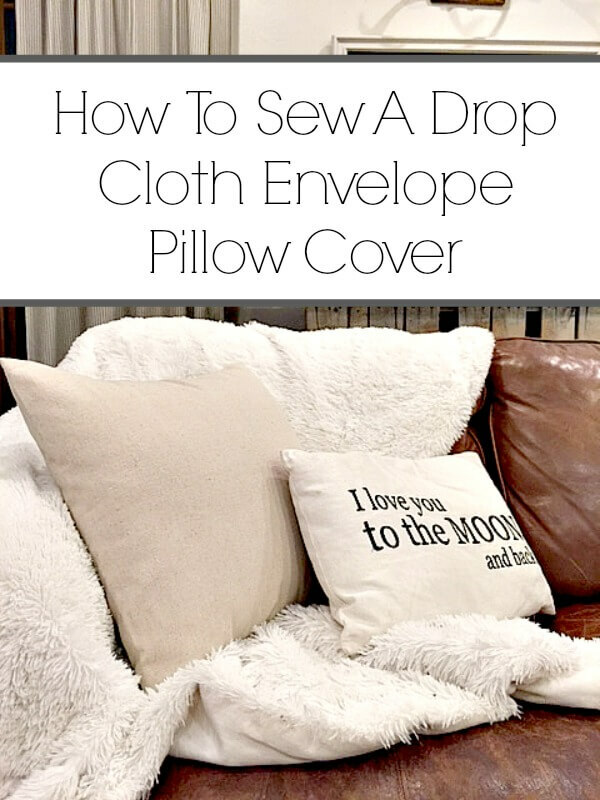 I feel like I should take a step back and show you how to sew a canvas drop cloth envelope pillow cover. 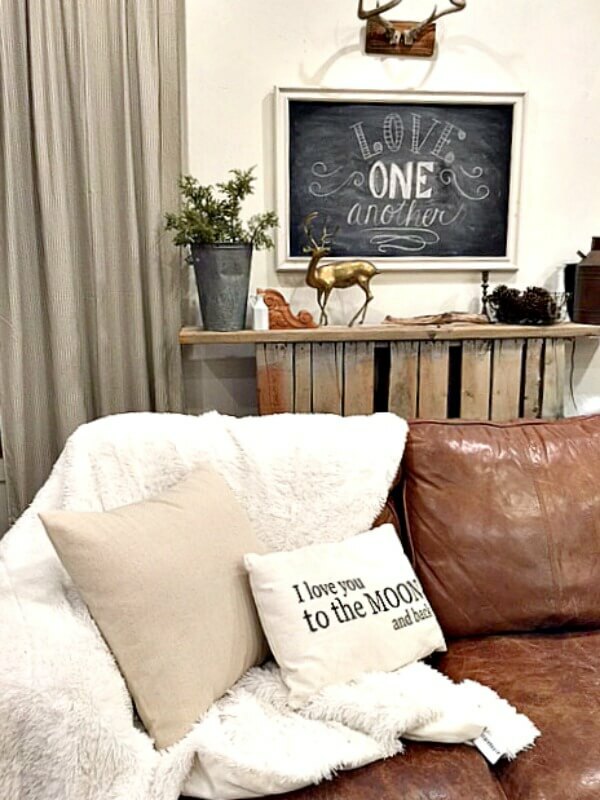 I love using canvas drop cloth for projects in my home. It is a very durable fabric, since obviously it was originally purposed for painters to keep paint off of surfaces. It is a thick fabric, and the soft neutral color is a fabric that can be used in so many different installations. 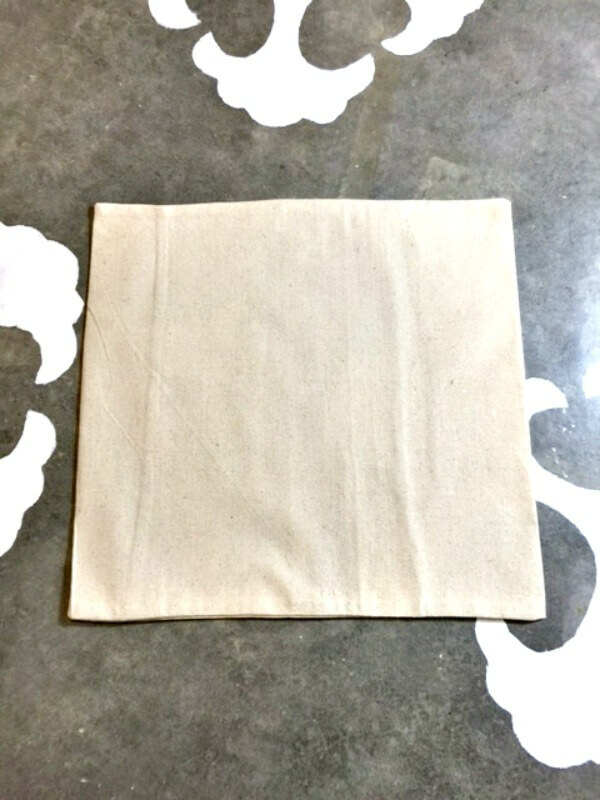 In terms of canvas drop cloths, there are so many different kinds. You can find heavier or thinner fabrics depending on what you want to use them for. I would advise using a thinner one for a project like this since you will be sewing them. 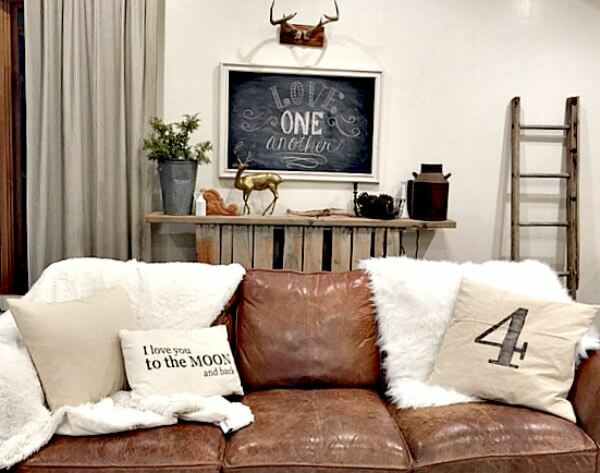 Now, the first thing to do is to get the right kind of canvas drop cloth. There are many different sizes as well as colors and textures. I hit the jackpot with this dropcloth. It is the perfect shade of creamy white and it is really soft! You can find it here . I bought a 4 ft by 15 ft drop cloth. I have found this to be almost perfect for my pillow envelopes. By using this size of cloth, I am able to skip a few steps. You will see what those steps are a bit more down the post. 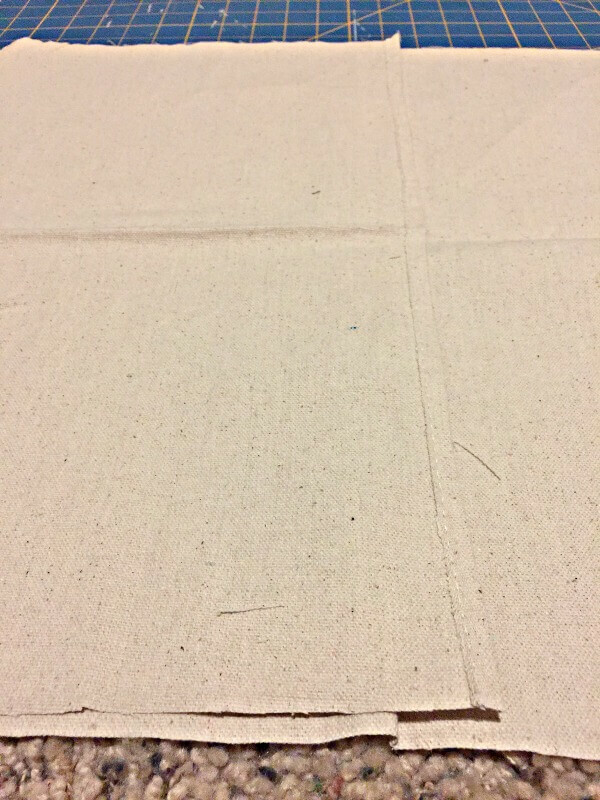 The first thing you want to do is fold the canvas drop cloth in half lengthwise. 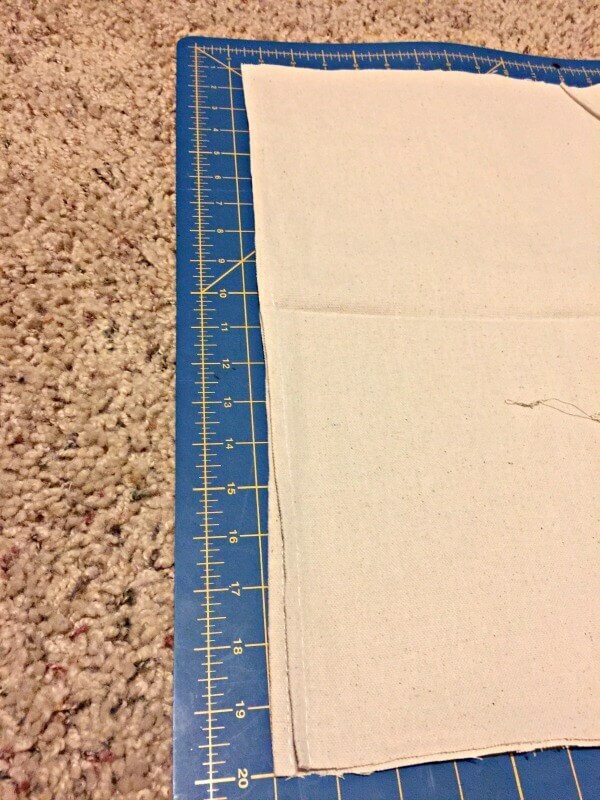 This is so you can make a smaller cut by doubling up the fabric. I am using an 18 inch pillow insert. So what I did was cut the fabric 20 inches wide. 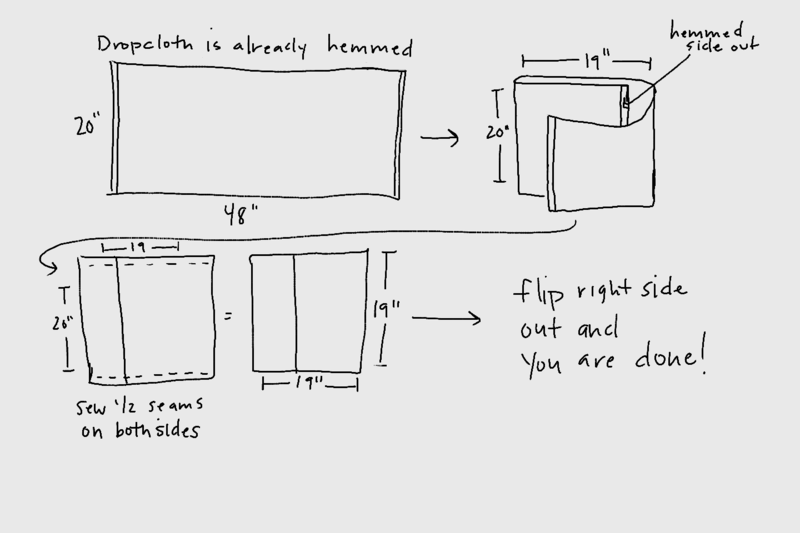 This will give the pillow the exact amount of space for the pillow. Once I am done with that I will show you this amazing little bonus about why I chose a more narrow canvas drop cloth. Since it is 4 feet wide, and since magically, these cloths come already hemmed, you do not need to do it! 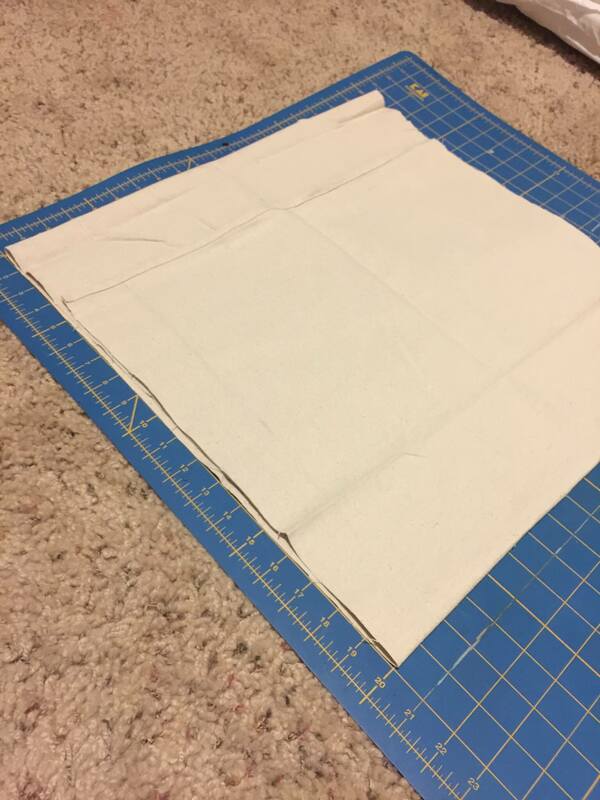 I flip over the fabric and fold one end into the middle. I then grab the other end and fold it over the first side. The key here is to make sure that this measures 19 inches. The reason why is because now that the sides are ready to be sewn(remember that this part of the pillow measures 20 inches), I will sew them with a 1/2 inch seam, which means you will be losing an inch and it will end up being 19 inches wide. Does that make sense? Whew! Now the pillow is essentially inside out at this point. 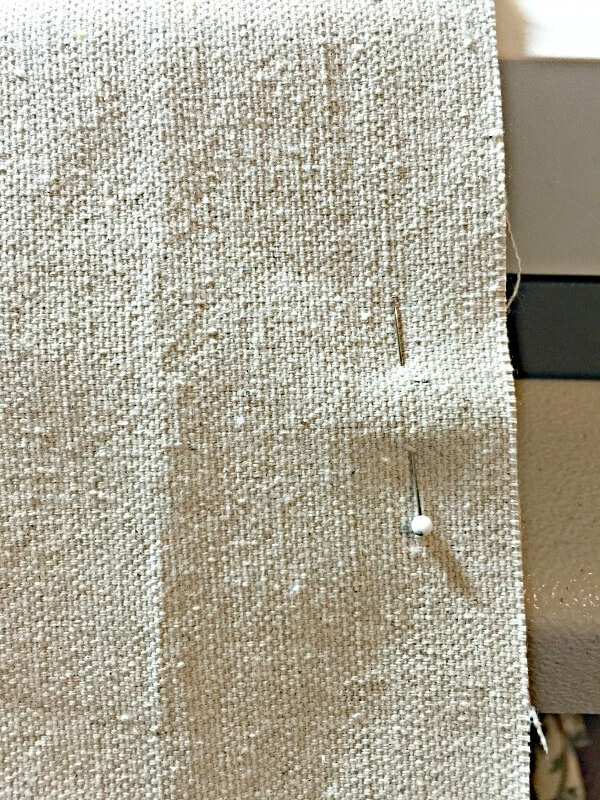 I stick a few pins in to secure the canvas drop cloth layers together while I head to the sewing machine. Once I have sewn both sides with a 1/2 inch seam, the pillow is done…well except for a little ironing. Off to the iron I go! Canvas drop cloths are notorious for having a few wrinkles, but nothing a little steaming can’t take care of. Once I have it all wrinkle free I turn it right side out and put the pillow in to see if it fits. Like a charm. Now I am off to decorate it somehow. I havn’t quite decided yet what I will do, but don’t you worry, I will definitely be showing you! If you do not have a drop cloth that is this narrow, you can always cut it 20 inches wide by 48 inches long. 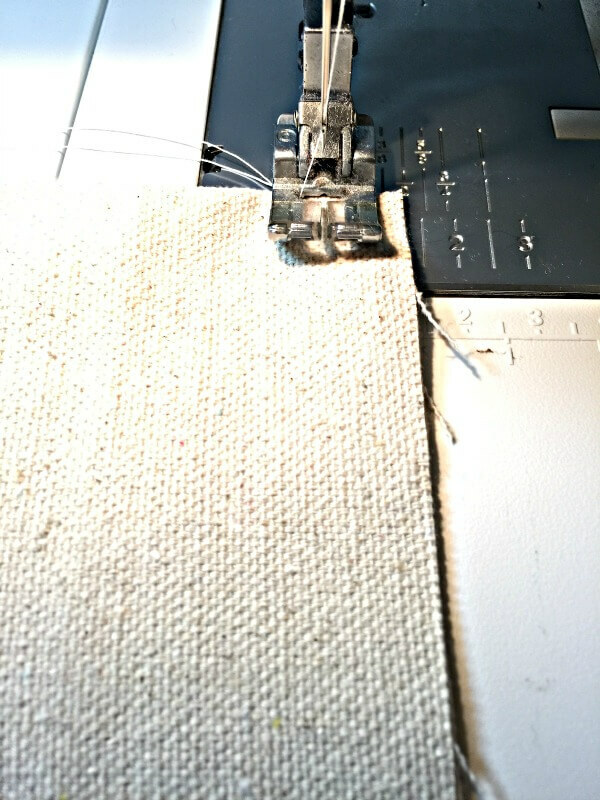 This will allow for a good amount of overlap and you will have to hem the ends, since it will not already be done for you. Here’s a little sketch to sum up the project. Sometimes things make more sense to me when I can see it in a picture:) Learning to sew a envelope pillow cover is quite a valuable skill to have if you like to trade out your pillows often. It can save you a good amount of money! Now, here it is hanging out on my couch. I am currently trying to decide what design to create on it. I have too many ideas and not enough time! For now, I’ll let it hang out here and maybe I will get to snuggle it later on while I watch Jimmy Fallon. Have a great day! I hope you’ve enjoyed seeing how to sew an envelope pillow cover. Wow. I Love the pillows. So easy. I must say, the picture you used to show how you folded and made the cover was FABULOUS because I also find it way easier to do things by seeing how they are done. A big Thank you for that?? Thank you so much! To tell you the truth I almost didn’t put the drawing but it just made sense to me! Haha! Have a great day and thanks for stopping by! What a great tutorial, Sara! I love using Drop Cloths in decorating! Thank you for sharing at Brag About It link party (Mondays at Midnight) on VMG206 this week! Thank you Megin! I have an obsession with drop cloths these days! Now pillow covers I have done. Very cute. Pinned and shared. Thanks for linking up at #ThursdayFavoriteThings! I hope you will join me at #OverTheMoon! Thanks Marilyn, Have a great day! 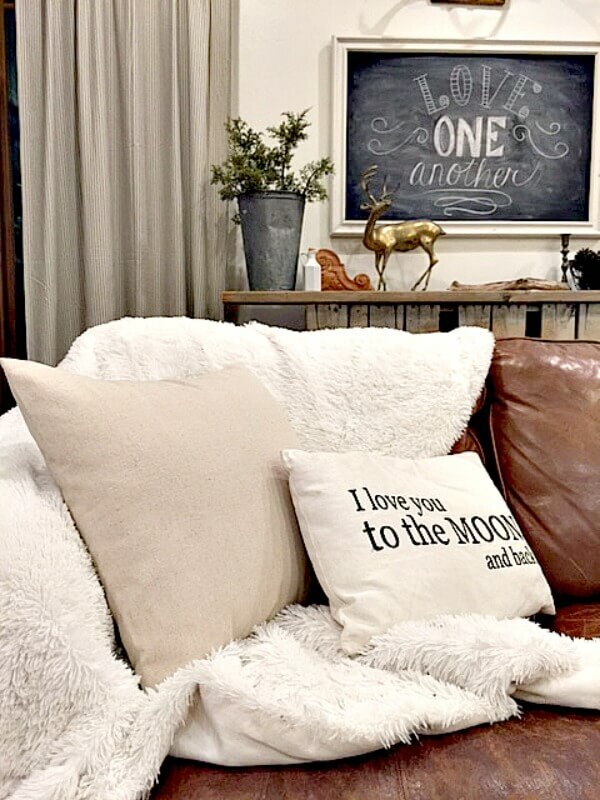 Super cute pillow…I love your whole room-so pretty! Thanks for the tutorial! Thank you Kristine! Have a great day! This is an amazing idea! Thanks for sharing at The Pin Junkie Pin Party. I love envelope pillows great style and look.